Nami Island in chuncheon (Namiseom, 남이섬) tour & map. This half-moon shaped island located about 63 km to the northwest of Seoul was formed as a result of rising waters caused by the construction of the Cheongpyeong Dam. Also known as Namisum, the island's name comes from General Nami, who served under King Sejo of the Joseon Dynasty. The General's grave is supposedly buried on the island marked with a commemorative mound, but the exact spot remains unknown. Nami Island has been developed through the years as a recreational spot and nature preserve, with lodging facilities like camping sites, villas and bungalows. It also offers a number of recreational activities like outdoor sports, swimming, boating and water-skiing. There are dining establishments, as well as a museum and mini-theme park with rides, a roller-skating rink, and a shooting range. The relaxing, laid-back vibe of the island is popular with couples and families, who travel there during weekends and holidays for outings and picnics. 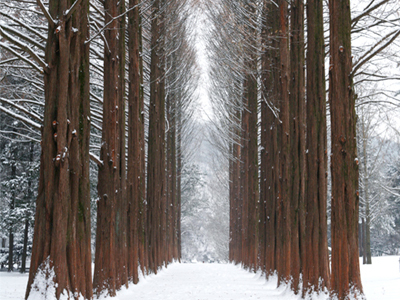 Noteworthy features of Nami Island are the many scenic tree-lined pathways with 40-meter tall metasequoias. The island is home to many varieties of trees, including Korean pine, birch, chestnut, maple, poplar, and many more. The trees change with the seasons, providing a natural panorama of ever-changing colors. To further preserve the natural features of the landscape, there are no exposed electric wires or telephone poles to be seen on the island because they're all buried underground. 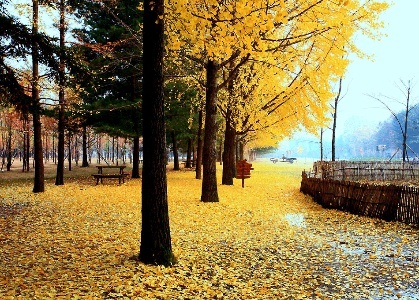 In 2002, Nami Island gained tremendous popularity and prominence when a hit Korean TV drama series, Winter Sonata, featured the island as its main setting. As a result, viewers across Asia suddenly became aware of Namisun, and the island became a must-visit place for tourists. Until now, many fans of the show flock to the island as a kind of pilgrimage, retracing the steps of the TV characters and taking pictures of the lovely spots featured in the series. Discover why Nami Island’s beautiful setting has captured the hearts of people everywhere; All Seoul Tours includes a stop on this popular tourist spot in our ECO Tour Railbike & Nami Island package, as well as our Great Scenic Nami Island & Petite France Village Tour. Find out more about our other package tours that will make your Korea visit truly unforgettable by contacting us today.